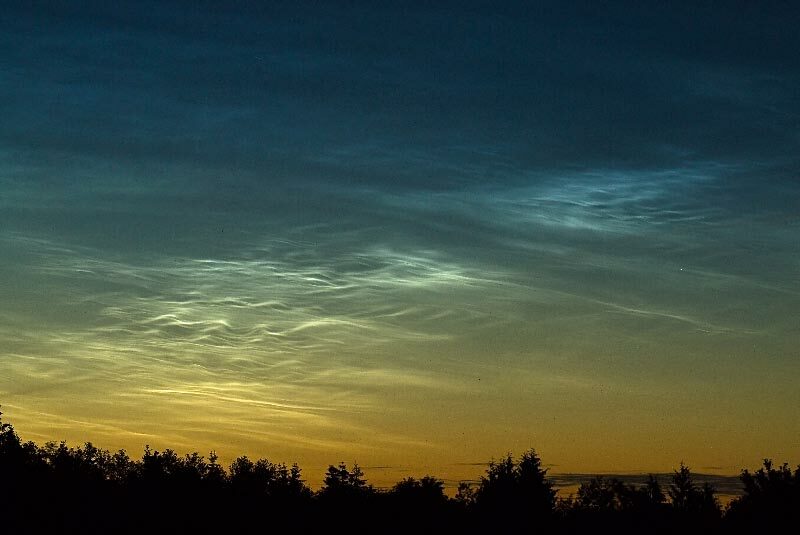 Quite an introduction to noctilucent clouds for me this week. Had never seen them here at 52º north before--and now twice in a week. 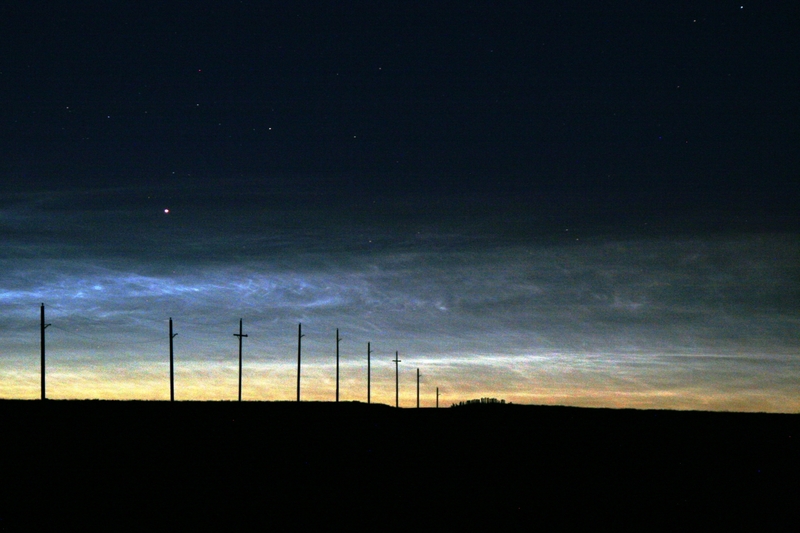 These were much brighter and seemed more dense than the showing on July 1. Beautiful! 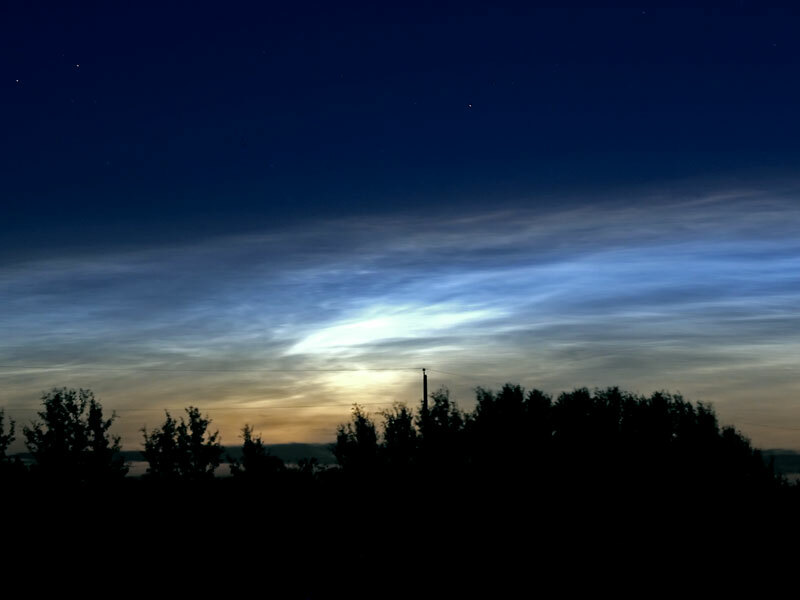 This is our first sighting of noctilucent clouds. We were surprised to see them so late, an hour and a half past sunset. 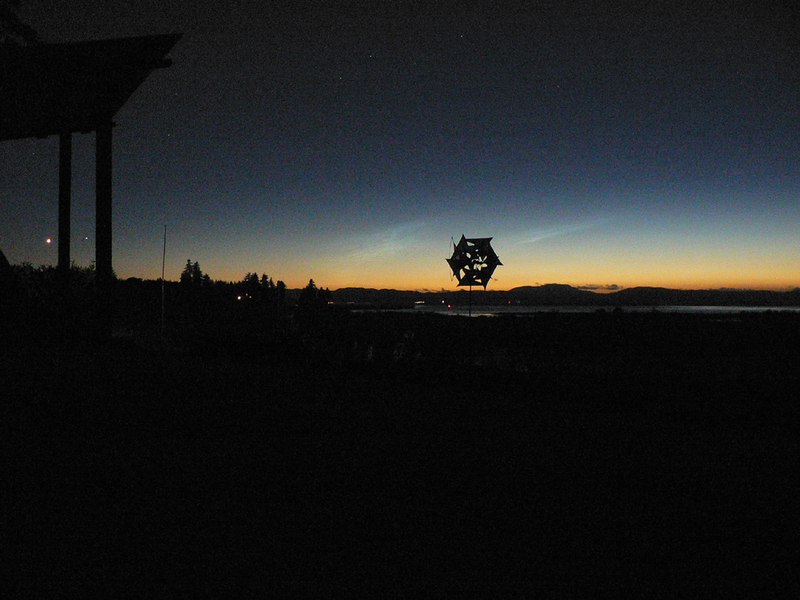 We first noticed them at 10:30PM PDT. 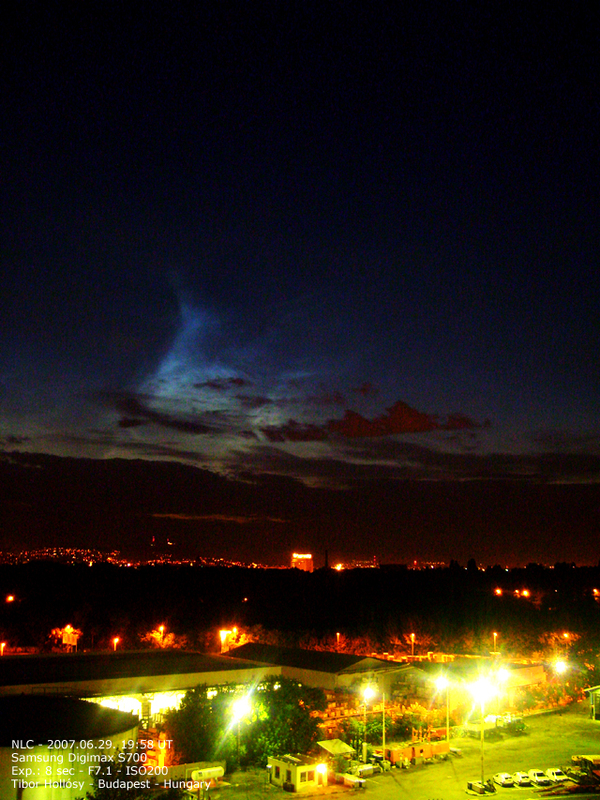 By 11:15PM PDT, they had pretty much faded from view. 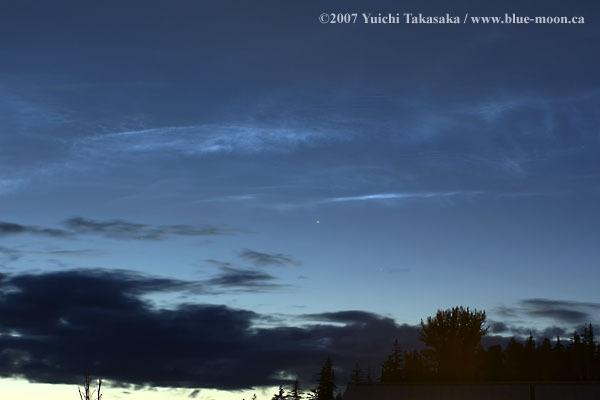 Photo details: Nikon D200, 30 second exposure at ISO 200, f8, 150mm. We watched the sunset from Huricane Ridge in the Olympic National Park. 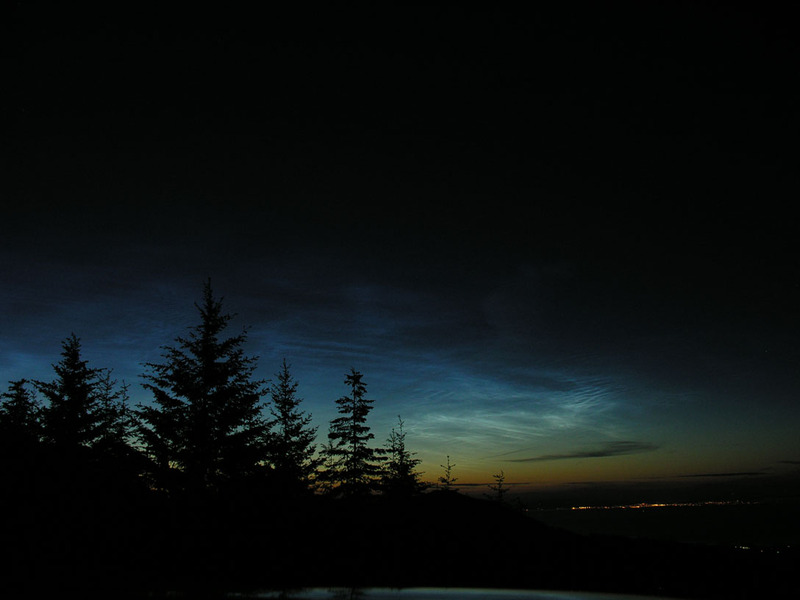 Coming down the mountain at about 22:30 looking NW, from about the 3000 foot elevation, we saw NLC over Vancouver Island and the lights of Victoria, Canada. 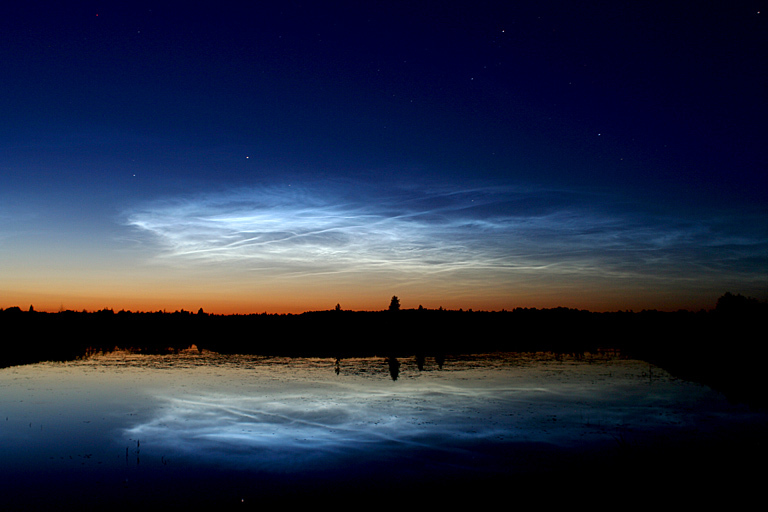 Look into a cloud and what do you see? A flying elephant? A mouse? A dragon? Finding shapes in clouds is called nephelococcygia (refs: #1, #2). 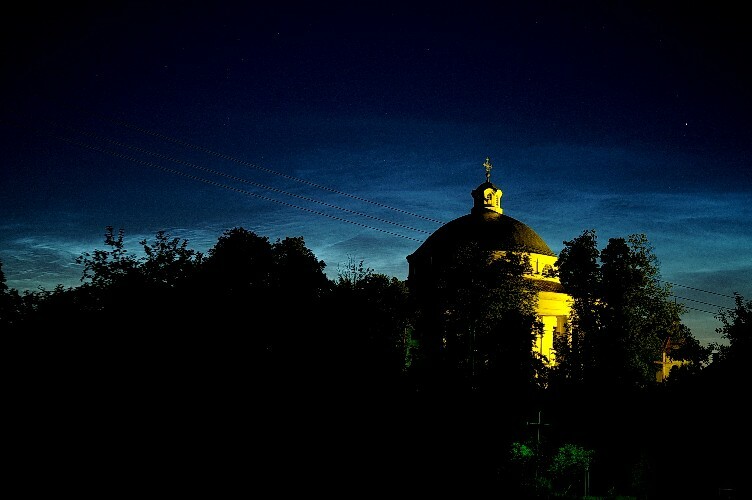 On July 3, 2007, Lithuanian photographer Donatas Tamonis conducted noctilucent nephelococcygia. 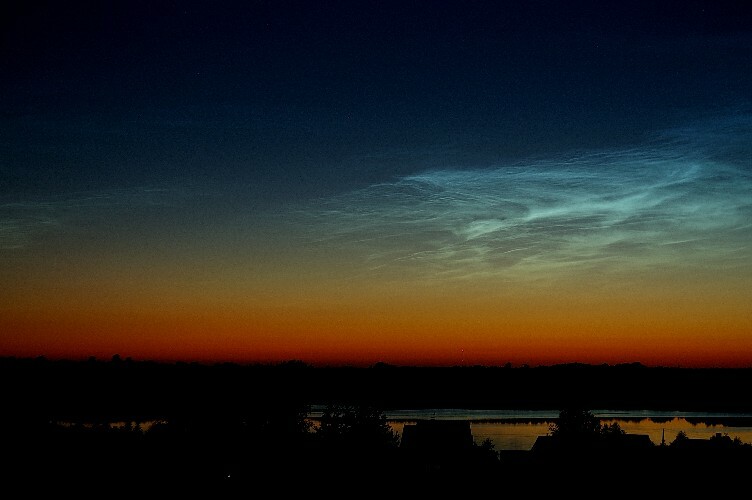 "This bright noctilucent cloud reminded me of a giant squid," he says. 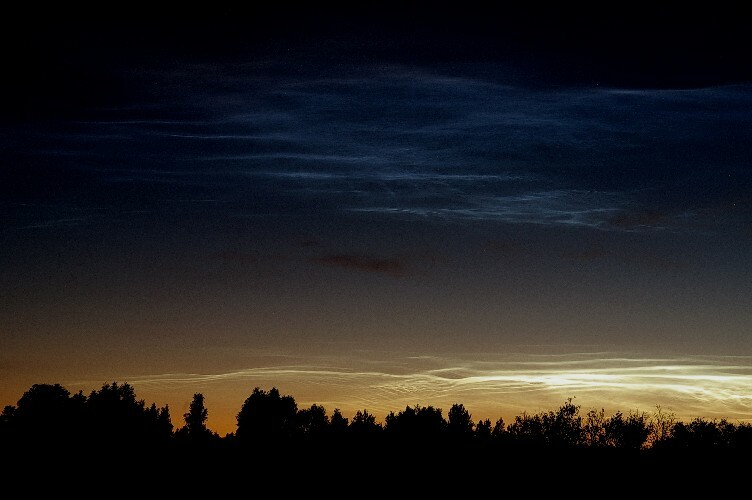 "Clouds often take various shapes that remind us of something. 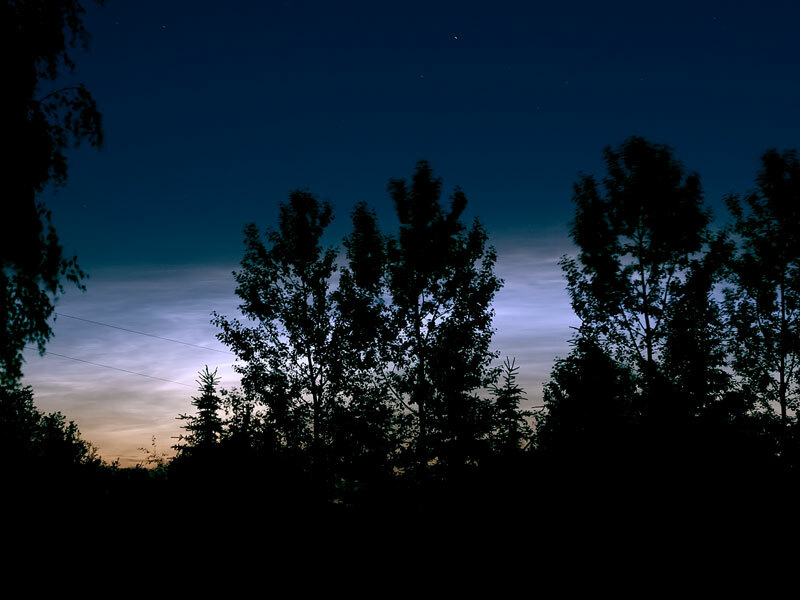 Noctilucent clouds are no exception." I was waiting to photograph moonrise but the southern sky was totally cloudy. 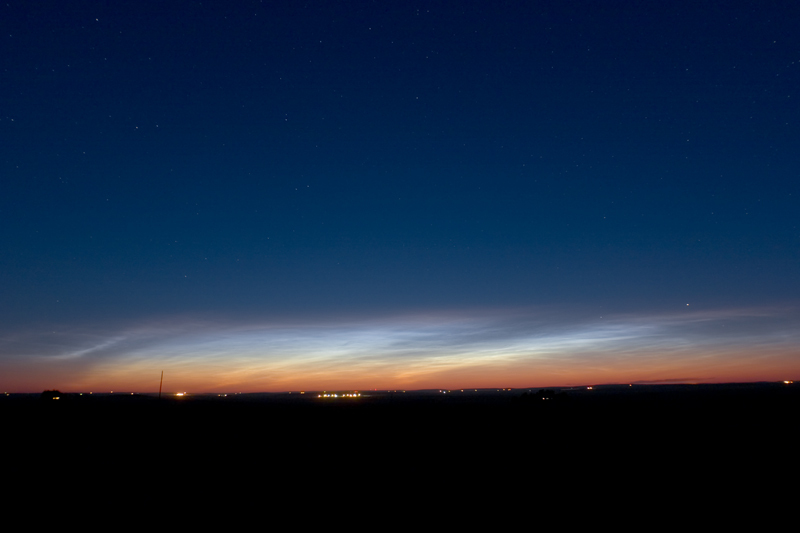 I looked the north and NLC were out there in the small pocket of cloudless sky. It only lasted about a half hour. 12:24 to 12:50 PST for the GIF animation. 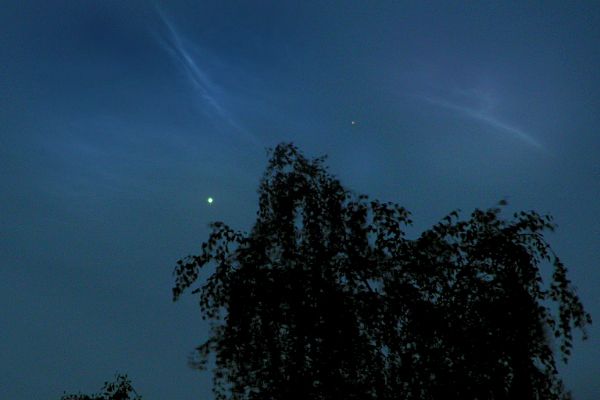 Last night, after the clouds were disappeared, I saw Venus and Saturn in the west, side-by-side. 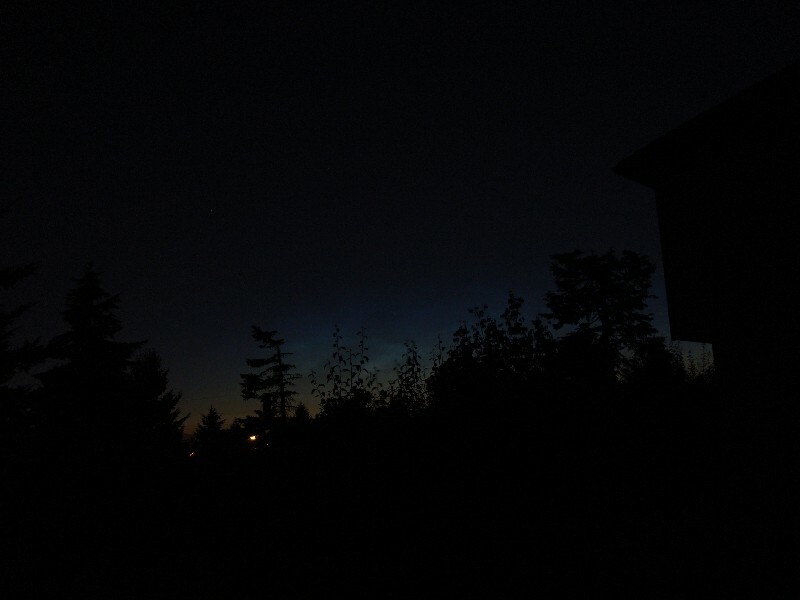 Ten minutes later appeared some noctilucent clouds, and it was the first time I took a photo of them.